I recently had to get rid of my living room sofa, and I have been on the hunt for a new one. I want something with clean lines and super neutral. I know some people are all about color, but I like my room to be plain, so I can add my color transiently, be it with crazy mantelscapes or fun throw pillows, or my own art work. 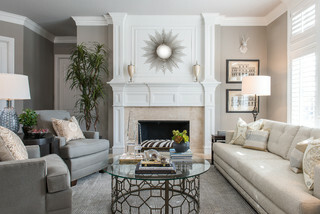 I also just saw that Sherman William’s recently annouced their 2017 color of the year: Poised Taupe and I thought it was the perfect jumping off point for a living room. Style wise, I'd say I'm definitely transitional. A balance of traditional elements along side clean lines of modern pieces. I don't do farmhouse, rustic, shabby chic, french country or ultra modern. I do like traditional mixed with contemporary or industrial pieces. That ia a hallmark of transitional design. Transitional design is also known for its casual, comfortable and child friendly features, and it has a sense of warmth and coziness. The perfect family home! It features a balance of clean lines, and curves, without being too ornate or gaudy. Often homes for sale are staged with tranistional style, since it generates the feeling of welcoming.